This is a new course designed for people who have little drumming experience. Some participants had already undertaken some percussion studies; others had recently joined their local Samba Group. 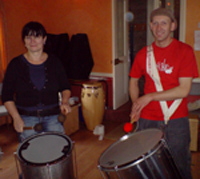 This course is an ideal opportunity for people to try out new instruments, which is not always possible in a local Samba Group, and to obtain an insight into how patterns work together. We continued with hand drumming studies focussing much of the module on the congas. We revised the Samba rhythms covered in module one and added new elements and patterns. The group was introduced to Tumbao and learnt how to play a basic pattern ‘in clave’ with patterns for one and two drums. We also studied some traditional rhythms and songs, Ijexa (from Brazil) and Iyesa (from Cuba) including phrasing for the lead drum. This gave students an opportunity to learn how to construct a solo. The material was diverse with studies on a variety of instruments and people gained an insight into a range of Cuban and Brazilian music styles, including Yambu (Cuban Rumba played on boxes). We covered basics on Pandeiro, 6/8 rhythms for congas and also learnt different ways to play certain lines on snare and/or repinique by using single strokes, double strokes and paradiddles. The group supported each other extremely well, working lots in small ensembles and everyone was encouraged to sing. For the bateria we worked through a Samba Reggae. Instruments: Congas, Cajones, Surdo, Repinique, Snare, Tamborim, Agogo, Cowbell, Pandeiro and Shaker. Technique: More exercises to help develop tones, co-ordination and to build up stamina. Exercises included working with double strokes and paradiddles. “I immensely enjoyed the course, It was hard work sometimes but putting in the effort seemed to pay off. Again it was very diverse, opening my eyes to things I wasn’t even aware existed. “The bit where you practice in a small group without supervision was a good idea, with people sharing what they had retained and allowing us to solidify things.